Don’t let your infographics mislead! 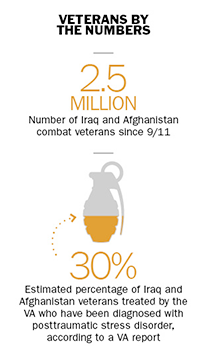 Or did you notice that the caption under the 30% says, “of veterans treated by the VA”? In fact, with the information provided, you can’t come up with a number of vets, because we aren’t told how many vets have been treated by the VA.
the second caption being full of qualifying phrases, in which this important one gets buried. the relative scale of the numbers and the captions. Furthermore, I question the choice of a hand grenade icon to represent PTSD. I’ve read previously in TIME that many vets with PTSD do not act out in dangerous ways. It would be a tragic irony if many people wrongly conclude that a huge portion of Iran/Afghanistan vets have explosive PTSD, especially since the accompanying editorial mentions that employers are often afraid to hire them. NOTE: This infographic does not appear in the web version of the article. However, it does appear in the iPad and print issues. Follow Nancy Wirsig McClure on Twitter @explanagraphics. Nancy blogs and speaks about infographics, logos & icons, and explanatory animation.